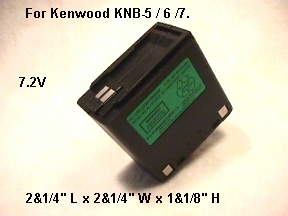 Replacement battery for KNB-5, KNB-6, KNB-7. PB-6 , PB-7 , PB-8 .radio model number TK 220, TK 320 , TK 240 , TX 340. Ni-Cad battery, 7.2 V, 1100 mah. Dimensions at 2&1/4" L x 2&1/4" W x 1&1/8" H. The battery is made by W&W Inc.